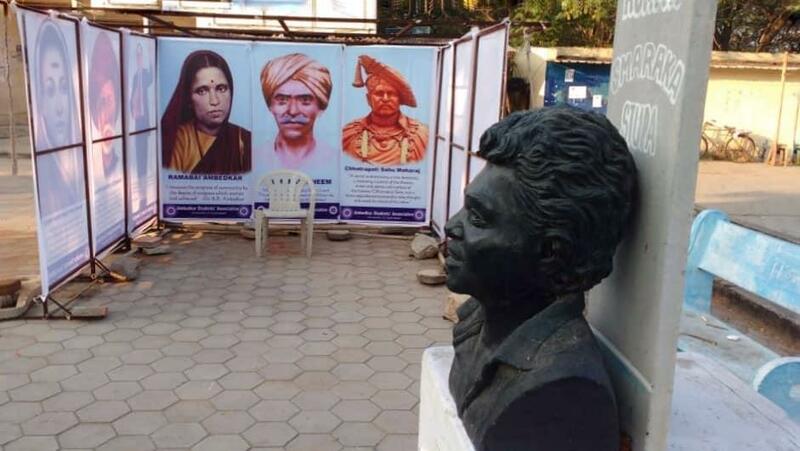 Students’ organisations are demanding that the state government take legal action against those responsible for demolishing the Velivada made of portraits of prominent leaders. On January 6, University of Hyderabad security officials demolished the Velivada, a temporary structure where dalit research scholar Rohith Vemula had resided for two weeks before he committed suicide on January 17, 2016. Students’ organisations in the campus condemned the move as “humiliating” the symbol of “resistance” and have begun a protest demanding the rebuilding of the Velivada where it was earlier and are urging the state government to arrest those responsible for the act including Vice Chancellor Podile Apparao. “Demolition of the Velivada is nothing less than an act of tampering evidence by VC Apparao as Rohith Vemula’s case is still pending in the High Court and Apparao has been booked under the SC/ST Atrocities act,” said Munna Sannaki, representative of the Ambedkar Students’ Association. Three years ago, on January 4, 2016, the Velivada was set up by five dalit scholars including Rohith Vemula, Dontha Prashanth, Vijay Pedapudi, Seshu Chemudugunta and Velpula Sunkanna when they were imposed with a punishment to leave their hostels and their movement was restricted in the public spaces inside campus. Claiming the punishment as a social boycott and politically motivated by the BJP, the students had raised the Velivada in the premises of the shopping complex within the campus and began protesting while residing there. It was made using the flexes of prominent personalities including Dr. BR. Ambedkar, Jotirao Phule, Savitribai Phule, Gurram Jashuva, Ramabai Ambedkar, Periyar EV Ramaswamy, Komaram Bheem, Chhatrapati Sahu Maharaj and Kanshiram. Velivada means a dalit ghetto, which are usually placed at the margins of villages. On the evening of January 6, the campus students held a candle light demonstration and burnt the effigy of Apparao at the demolished site. In January 2016, Rohith Vemula’s suicide had triggered nationwide outrage and protests wherein dalit activists and student leaders described his death as “institutional murder”. Maharashtra will go for second phase of polling on April 18 with 10 seats.